To help you navigate through the school selection processes, below are reader recommended preschools in the Houston area! This guide is intended to get you started in your search for a mother’s day out, preschool or bridge program. Details on hours/programs may change, so get the latest information by clicking the links and looking at the school websites. If you have more suggestions, please contact me at Jill @ BigKidSmallCity.com! Also, check out Winnie for a comprehensive, searchable and free directory of all the daycares and preschools in Houston. Listings include detailed descriptions, photos, tuition information, availability data and more. 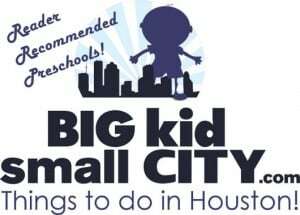 BigKidSmallCity.com is not endorsing any of the schools and is not responsible for any problems. If you have a concern, please talk to the school directly. To get BigKidSmallCity updates in your inbox, go HERE. Listings below with “*” mean they were submitted by the school rather than a Houston parent. If you are a Houston parent and want to endorse the school, tell me! On a parent’s work day, the parent and child arrive 15 minutes early and stay until all clean-up is completed. On your parent helper day, the parent must arrive by 8:15am and stay until 12:00pm. Monday through Friday, 8:00am-2:45pm, with before and after school options. 6 weeks to 4 year old preschool. PreK 3 & 4. Extended day options available. 2, 3, 4, and 5 day option. 2, 3 or 6 days. 8:00am-6:00pm options available. Flexible hours Monday – Friday, Early drop-off begins at 7:30, daily, Preschool program from 8:30am until 2pm, 2, 3, or 5 days a week, After care until 5:30 pm. 3 months to pre-kindergarten. Bridge program available. School Day: 9:00 a.m. – 2:00 p.m., 2 days a week to 5 days a week. After school activities available. 18 months through 5 years old. 18 months through 5 years old. Before and Afterschool care for 5-12 year olds. 6 weeks through 5 years old. Preschool for 3 and 4 year olds. School is also K through 8th grade. Pre-Kindergarten through 12th grade. Houston’s only nonprofit, private school for gifted children. Horses, bunnies, plants, pool and they teach Spanish. Infants through Middle School. Extended hours available. All Boys. PreK 3 and 4. 8:00am-3:00pm with extended day options. 2 years old through 8th grade. Pre-Kindergarten is 8:15am-11:45am with an option for 7:30am-3:15pm. Monday – Friday: 7:00am – 6:00pm options available. Monday – Friday, extended care until 6:00pm. 9:00am – 2:30pm, extended day 8:00am – 4:00pm. Walking to 6 years old. Up to 5 days a week. 9:00am to 3:45pm, with extended day available. Multilingual full immersion school that concentrates in Spanish, French, Italian, German, and Chinese instruction. 6 weeks through pre-K, Regular schedule 7:00am-6:00 and extended day 6:30-6:30. Afterschool enrichment Spanish and Chinese classes for kindergarten thru 5th grade. English is only spoken during 2 hours at the end of the academic day. 7:30 am to 3:00 with extended care from 3- 6pm. Chapelwood School for young children! I loved it there and so did my daughter! The Goddard School of Spring Klein! Memorial Lutheran School has a wonderful Early Start and Preschool Program through 8th grade! French Lanaguage Immersion Preschool that follows the French Ministry of Education’s curriculum for preschool aged kids. I second Memorial Lutheran School on Westheimer. We started there for Pre-school and our daughter will be entering 2nd grade there next year. We love the school! !